As I sat down to plan my response to this question I spent hours trying to come up with the perfect response so that educators around the world could solve this common problem. After hours of research, discussions with leaders all over the globe and a reality check, I realised that there is no magic key and no one answer to solve this problem. 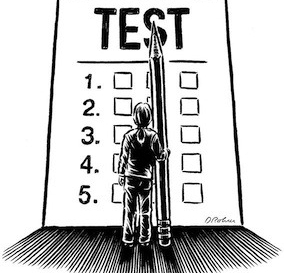 I see this all too often – Educators teaching to a test and the desire to get a ‘high mark’ in a standardised test (because apparently this will make me look good). My response outlines just how passionate I am about teaching and learning and how developing real life skills is more critical than wasting time preparing for an assessment. I am based in Singapore which has a world-renowned education system, ranking 2nd on the PISA 2012 Reading, Maths and Science test. As amazing as that is, I see the negative result of this pressure on students every day. Thankfully, my school focuses on teaching students how to learn, through real-life situations while teaching all content within our curriculum. What we don’t do is focus on ‘cramming’ our students to ‘do well’ in high stakes assessments. And I am proud to say that our students do incredibly well, in fact, they excel in all areas because they love to learn! I am a HUGE believer in my students bringing their best every day and as an educator my mindset is always teaching for understanding and never teaching to a test. I cover content from day 1 because I teach the curriculum established within my learning establishment. As long as an assessment covers the content and I don’t have to move away from these outcomes to waste time teaching to a test, I have no problem. If students have been taught the content and how to problem solve, they should not need to ‘prepare’ for a high stakes assessment. In an ideal world, I believe, that content will be covered throughout the year, being taught in creative engaging ways. If the content is taught in a variety of engaging and creative ways, students will not only discover a love of learning but they will know their content without the need to ‘cram’. I would prefer to see educators teaching inquiry skills, critical thinking skills, problem solving skills and giving students the opportunity to excel with reading and writing. These are relevant skills that relate to living in the world as a member of society. When has ‘being able to take a test’ ever got you a job? In summary, I believe the focus should be on how to learn and how to apply knowledge in a real world manner, not just preparing for an assessment. Life doesn’t look like a test and, as we all know, there is MUCH more to life after school. Teach your students how to learn and help them develop real life skills! I am expecting some comments back about this topic, as I believe it is highly controversial. There is so much more to say but with a tight word limit I won’t go any further. However, I encourage you to engage with me on this topic and let me know your thoughts. This is a hot topic for me as I am studying a unit on assessment for my masters degree. I am a senior mathematics teacher who spends a worrying amount of time marking tests and not planning effective lessons. I feel the students are becoming less engaged and it is hard to motivate them and at times myself. I believe we should be teaching them to be life long learners through an appreciation of mathematics as well as see the cross-curriculum links in learning. Our students are grade motivated and that is not effective. I would love to be able to find a better balance of teaching and assessment. This post really struck a chord with me. Thanks for all the great resources and ideas in your blogs. Thank you Taresa – that means a lot – stay connected – would love to hear more of your thoughts! I completely agree with you. We need to focus on developing skills in context rather than developing procedural knowledge for a test environment. In my experience, I have used questions and problems within lessons that are worded in similar ways to what students will encounter in their high stakes tests so that they are familiar with the language that is used in these circumstances. It is my belief though that if our students truly understand what it is they are ‘supposed to know’ according to the curriculum, then these tests won’t really be a problem. I totally agree with these sentiments. A few years ago I ran a program for underemployed low-income young adults that focused on reading, math, oral and written communications, computer and employability skills. We tested frequently for diagnostic and feedback reasons, and we had high stakes tests at the end to not only confer graduate status but also to determine how well we did as instructors. Students who graduated enjoyed the learning experience and thus performed well on these tests. More than 80% of graduates found career-track jobs or entered college without needing remediation within six weeks. http://www.educationviews.org/annual-march-madness-schools-learn/- describes Fast Break’s team approach. Thankyou for being the voice for many teachers against this style of assessment. I am greatly opposed to the pressure put on students for the purpose of ranking schools. Also quite timely as students here in Australia ‘prepare’ to sit NAPLAN (National Assessment Plan – Literacy and Numeracy in Years 3/5/7/9) next week. In my previous context I was fortunate to have a Principal with the same philosophy that if we are teaching the curriculum outcomes through quality pedagogy, our students’ grades will give a true representation of the teaching and learning in our school. Whilst we exposed the students to the format of the tests we did not spend wasted days practising or teaching to the test. From the very beginning of the year I encouraged my Year 5 students to engage with their learning for their own development however it took some time before they stopped asking “Will this be on NAPLAN?” The pressure they were feeling already was weighing on them 4 months out from the assessment date. No 11 year old needs that. I will acknowledge that the standardised assessment can give us some trend data but the one off assessment grading for students can be misleading and can cause barriers for learning in the future. On one occasion I had the most highly gifted Year 3 student I have ever had the pleasure of working with but when it came to NAPLAN, he point blank refused to do more than put his name on the cover sheet. Needless to say, his data would indicate that he was a poor student which couldn’t be further from the truth. There has been some discussion about extending this standardised assessment to other Key Learning Areas as well and I am concerned about the potential damage this may cause to our students and the potential reduction of quality teaching in our schools if Principals and teachers are buckling to the pressure of school ranking websites.